Slide 1: Machine control fun. This instagrammer really enjoys getting the most use out of his machine control. Slide 2: Short & to the point. This welder on Instagram is not afraid to be blunt and direct while on the job. Slide 3: “Do not step on this!” This Instagram user loves admiring notes left by others on his shop floor. Slide 4: “I’ll kill you.” …Well, remind us to never touch that guy’s stuff on the shop floor! Slide 5: Old, but not Obsolete. We love seeing hand-written G-code. There’s a certain beauty to it. Slide 6: Coolant, please! We’ve all heard the shop floor joke of “don’t drink the coolant” – well, don’t forget it for the machines, either! 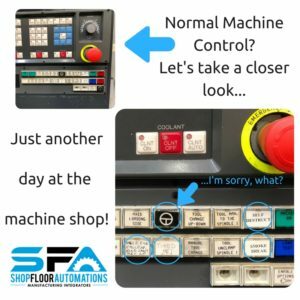 We love all this, but here are a few suggestions: Machine monitoring gives alerts to your coworkers throughout the shop floor, such as material needed or to not touch your stuff. DNC software will help with managing programs and revision control. We also recommend PDM to go paperless. You can call (877) 611-5825 for more info on productivity solutions, or if you want to share more funny shop floor photos like this. We love them!